Okay, I'm giving it another whirl. Every few years, I go out and buy myself a Euphorbia pulcherrima, better known as Poinsettia. I hadn't planned to do it again, but I stopped into a local chain drugstore to buy an eyeliner pencil, saw that they had some nice-looking, inexpensive, Points (nickname used by hort professionals) and decided to take the plunge. I don't buy them because they excite me as blooming plants. I much prefer Hippeastrum and Schlumbergera for my holiday blooming needs. (Actually, I don't have holiday blooming needs--I just love Amaryllis and Christmas cactus.) I buy them because I enjoy trying to grow Poinsettias as regular green plants. I actually think they are very handsome plants when not in bloom. In the past, I've succeeded at this for periods ranging from a couple of months to a year or so. In fact, the only reason that I don't have the last Point I bought a couple of years ago is that it became a low-priority plant at some point, and didn't get repotted promptly. It became root-bound, dried out once too often, and that was the end of it. Actually, maybe that didn't need to be the end of it. 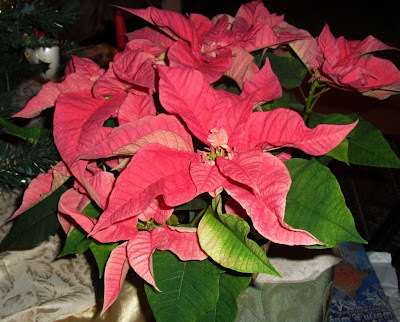 Once, many years ago, I bought my grandmother a Poinsettia for Christmas. This was my generally plant-indifferent paternal grandmother, not the plant-loving maternal grandmother I have mentioned previously. Grandma kept that plant until she died. Under her erratic care, the thing lost all of its leaves, but lived on as a bunch of bare green stems for years. It resembled nothing so much as a mutant Euphorbia tirucalli, known popularly as a Pencil Tree. You've got to love, or respect, or just go WTF at a plant like that. 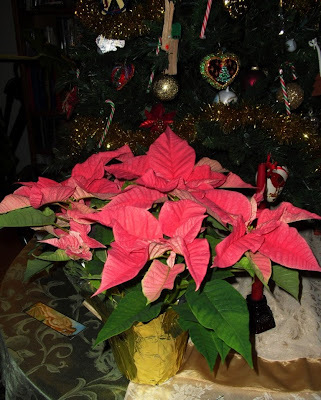 Since that plant was pink, like the one I purchased today, maybe this one will be my first truly long term Poinsettia success. Speaking of eyeliner pencils, I actually have a plant-related anecdote regarding one. I bought my Sansevieria hargesiana back when I lived in New York. Though I never thought that the light coming through my west facing window was all that strong, it was apparently strong enough to burn my plant. I was embarrassed by the small, straw-colored burn patches, so I actually colored them in with green eyeliner. 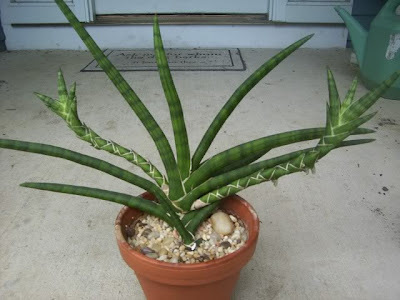 Sansevieria hargesiana about three years ago. I had removed the damaged growth by then. I've placed it outdoors and it has never gotten sunburned again. That is probably a first. Plenty of people dress up their pets, but how many apply makeup to their houseplants? What was that that my stepson calls me again?